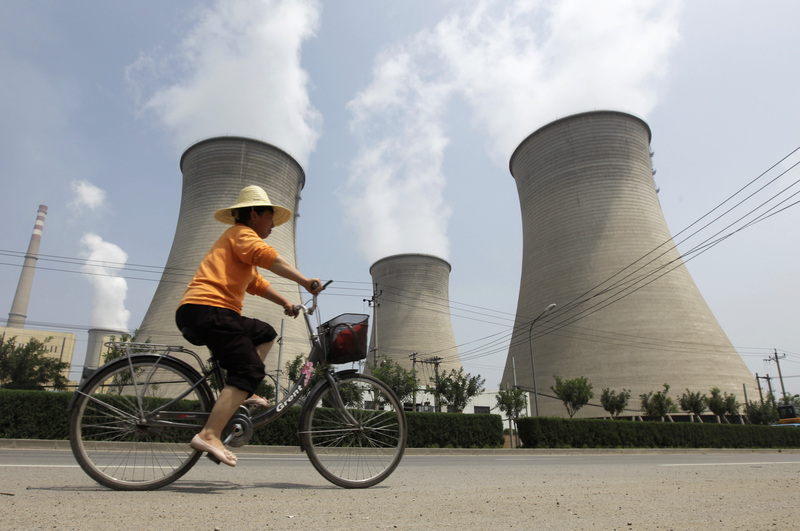 A woman rides a bicycle past the water-cooling towers of a coal-fired power plant in Beijing, on July 21, 2010. Rising emissions of greenhouse gases including carbon dioxide, methane, nitrous oxide, and others since the Industrial Revolution are the driving force behind climate change. Responsibility for producing these greenhouse gas emissions can be evaluated through multiple lenses. One way to understand responsibility for greenhouse gas emissions is to examine which countries emit the most every year. Land-use change and forestry (LUCF) refers to emission and removal of carbon dioxide due to activities like land clearing for agriculture, shifting cultivation, and wood harvest. These lists include developed countries including the United States and EU member states, and large countries undergoing rapid economic growth, such as China and India. It’s also important to note that these countries produce a majority of global emissions. In 2014, they accounted for more than two-thirds of global greenhouse gas emissions. And the one hundred countries that emit the least? They collectively produced less than 3 percent of the world’s greenhouse gas emissions that same year. Another way to analyze emissions is by calculating the total emissions a country produced over a specific period of time. This measurement is variously known as cumulative, total, or historical emissions. This ranking excludes land-use change and forestry. Please note that individual EU member countries are excluded as their emissions are incorporated into the total EU measurement. Looking at emissions through a historical lens starkly illustrates the uneven history of industrialization: about half of total carbon dioxide emissions have been produced by the first handful of countries to develop. Industrialization prompted mass gains in standards of living in those countries and huge increases in their emissions, which have only compounded with time. Although China tops the list of annual emitters as it fuels its own rapid development, for example, its CO2 emissions contributions account for only 11% of the historical total. A third way to view emissions is on a per capita basis, which divides total greenhouse gas emissions by a country’s population. This ranking includes land-use change and forestry. At the top of this list are small countries with energy-intensive industries. Other large per capita emitters include countries with high rates of land-use change and deforestation relative to their populations, such as Guyana and Paraguay. Belize makes an appearance on this list because it attributes much of its emissions to waste disposal and treatment due to landfills, tourism, and an underdeveloped recycling industry. Examining emissions through a per capita lens also exposes differences among top annual greenhouse gas emitters. For example, the United States’ per capita emissions (20 tCO2e) are more than eight times those of India (2.38 tCO2e). Although each year, the United States and India rank high in terms of annual emissions, large developing countries such as China and India emit far less per capita due to their large populations, both of which exceed one billion people. Countries aren’t the only “emitters.” Emissions can also be analyzed in relation to the economic sector to which they belong. Emissions related to energy are tied to a variety of sources, including electricity and heat production, manufacturing and construction, and transportation. About two-thirds of emissions from agricultural sources comes from cattle belching, which releases methane, and the use of fertilizers, but also manure management, rice cultivation, field burning, and fuel use on farms. Industrial processes refers to emissions produced by industrial activities unrelated to energy, such as the carbon dioxide emitted during cement production, or emissions released in the use of soda ash, a material used in glass manufacturing and the production of soap and detergent. Land-use change and forestry emissions come from activities such as deforestation. Waste emissions are produced by waste elimination processes such as incineration and landfilling; as organic material in landfills disintegrates, for example, it produces methane. Bunker fuels power ships and aircraft. The term refers to the thick, viscous oil left over after crude oil goes through the refinery process to extract gasoline and diesel. Only large, complex engines like ship engines are able to heat up bunker fuel enough for it to combust. It is also possible to identify individual company contributions to climate change over time and by year. Scope 1 refers to emissions from direct operations of companies. Scope 3 refers to indirect emissions of a company's operations, such as emissions from sold products or services. According to one study, since 1988, just 100 companies have produced 71% of industrial greenhouse gas emissions (counting both carbon dioxide and methane). In 2015 alone, fossil fuel companies and their products, particularly oil and gas, were responsible for 91% of global industrial greenhouse gas emissions and around 70% of all greenhouse gas emissions tied to human activity. This includes both corporate and state-owned entities.